Make cleaning fun (and cheap!) and get the kids to help too! 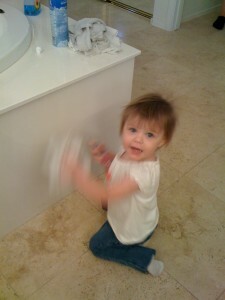 What can we say, when you get kids motivated to clean, if nothing else...they're FAST! Here are my top four tips on getting — and keeping — your house super-clean without much effort. 1. Have a basket contest. Are you playrooms and bedrooms messy and completely disorganized? Give each of your children a basket and have a contest to see who can get the most items in the basket in two minutes. Reward the winning child with a small prize. 2. Sing, dance and clean. Put on a sing-along, and have everyone sing and dance while cleaning. For young children, try the Barney cleanup song: It’s fun and short enough for a young child to learn. When children clean out a toy box or room, it may be hard to get them to depart with things they don’t really need. Set a number of items for them to get rid of, and reward them for donating a certain amount. It teaches them to depart with items they don’t really use, and it cuts down on clutter. 4. Give a child a spray bottle. This tip worked great for my own kids, since every child wanted to help and not feel left out: For children that are too young to help with cleaning, give them each a clean paper towel and small spray bottle filled with water. Ask them to help you by cleaning the refrigerator door or something in the area that you are currently in. I recommend buying a new, empty bottle that didn’t previously have cleaner in it in case your children spray it in their eyes or mouth. When you’re done, children can put away their “special” spray bottle of cleaner until next time.